Ok, the reviews are in and needless to say they are all very mixed. Billy Crystal’s much-anticipated comeback was trending on twitter as a snooze feast, however in his opening he welcomed everyone to the “chapter 11 theater” referring to the recent bankruptcy filling of the Kodak Theatre. It brought everyone back to reality in my mind, which later in the show Billy seemed to back me up, when describing the ceremony as rich people on parade giving each other awards. However it was nice to see his return. As for my predictions, year after year seems I never have a high ratio of winners, but this year finally I can say “I knew they’d get it”. The Artist, the much talked about creative achievement was the big winner “as predicated”, again many mixed reviews on the winner, but I always felt the film was a subliminal middle finger to the 3D Generation. Well earned I must say. The Acting awards didn’t disappoint, however, some surprises, seems the ones that America were rooting for missed the mark, such as Michelle Williams Losing to Madame Meryl. I had predicated Michelle to Win, but the IRON LADY was beyond thrilling, and it was good to see Meryl win, after Seventeen nominations, but don’t pity her win, this is her 3rd after all. However, a crowd favorite for a win was fulfilled when Octavia Spencer won for Best Supporting Actress, with her win America also got an Acceptance speech worthy of viewer ship. As for the boys, well I was rooting for Clooney, in fact that was my predication, the only predication I had made against The Artist. The french, again, took it home with Jean Dujardin’s win. As for supporting, Christopher Plummer finally got his due for his role in The Beginners, stating the Oscar was a mere two years older than he was “wow”. I may not have had a high number of winners when it came to the actor awards, but I did score Best Picture. The Artist, the silent film that was, I feel very much worthy of the win, even though snubbing John Goodman, hell even that dog was awarded something. Same goes for Berenice Bejo, however it was a tough company of actresses to go against this year on her side of things. None the less, it was a great show, I will add ,not having musical numbers made it Drag on, why the Academy decided to cut down the number of Best Songs nods we wont know, what we do know is that The Oscars have had dwindling ratings, and the Fact that Madonna and Elton were snubbed for a nod was a jaw dropper considering Madonna’s win at the Globes. Madonna clearly would have helped in the ratings not to mention the cattiness Elton and Madge always provide! And Now time for the BEST and WORST Dressed, To be completely honest the red carpet was a tad lack luster this year, but there some breath takers, and ick factors. No one Trend made its appearance other than Gold crusted gowns, and White Dresses, however there were so few of them that they hardly constituted a trend, So here’s my list of winners and losers, one thing the best and worst lists all have in common this year is that they all seem to be different. 1. Gwyneth Paltrow in a stunning TOM FORD, it was architectural, sleek, razor-sharp and stunning! 2. J.Lo, in spite of her Nip Slip on the red carpet as well as on stage, her Zuhair Murad is what Jenny from the block does best, SEXYness. 3. Milla Jovovich in Elie Saab, i have always been a sucker for anything a-sym, and fabric gave fab texture which looked amazing on-screen. 4. Stacy Keibler personifies her gold digger rumors, with this amazing GOLD Marchesa gown, liquid gold is always a hit on-screen. 5. and finally, the legend herself Meryl Streep, again the gold fluid looks seem to have been my weakness this year, however this dress by LANVIN is extra special given its one of the 1st eco-friendly gown created by the Fashion House. 1. The Sack of Leg dress, Angelina clearly was a show stopper with this Atelier Versace gown, but having to use a body part to show the overall look of the dress was a bit tiring, although a stunning black velvet piece , it just didn’t transmit on-screen, just looked like a really expensive torso hugging trash bag with a tear up the side. 2. Shailene Woodley in Valentino , there was already one nun on the red carpet we didn’t need two, were was the glam? 3. Glenn Close in Zac Posen, considering her role as Albert Nobbs, it would have been nice to a lot more glamour, perhaps losing the tailored blazer would have been enough 4. Kristen Wiig in J. Mendel, this looked reminded me to much of Demi Moore’s Versace dress at the 2010 Oscars just made of tool “ick”. 5. Melissa Leo, although keeping in the black and gold trend, this 2-n-1 dress just didn’t say glam, seems she couldn’t decide what to wear and merged two looks in one. 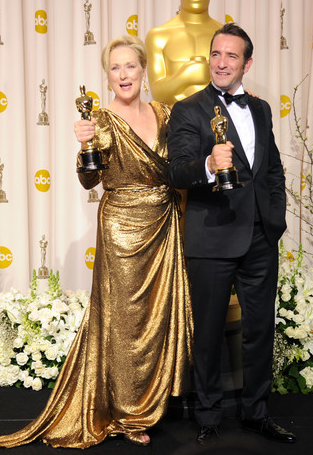 This entry was posted in | and tagged ABC, Best Dressed, Oscars, OSCARS 2012, Worst Dressed. Bookmark the permalink.